The digital world has been constantly evolving and with it the technology we use to access it. Tablets themselves have become the go-to resource for on the go professionals or people who want to relax away from their desk. As tablets get more and more streamlined, demand for higher quality products at a lower price will become immense. WinBook tablets have been in the technology production market for the better part of the last 25 years. Their newest tablet, the WinBook TW700, released with the hopes of competing directly against products like the iPad and the Kindle. Priced competitively we had no choice but to get our hands on the machine to see how it handled. 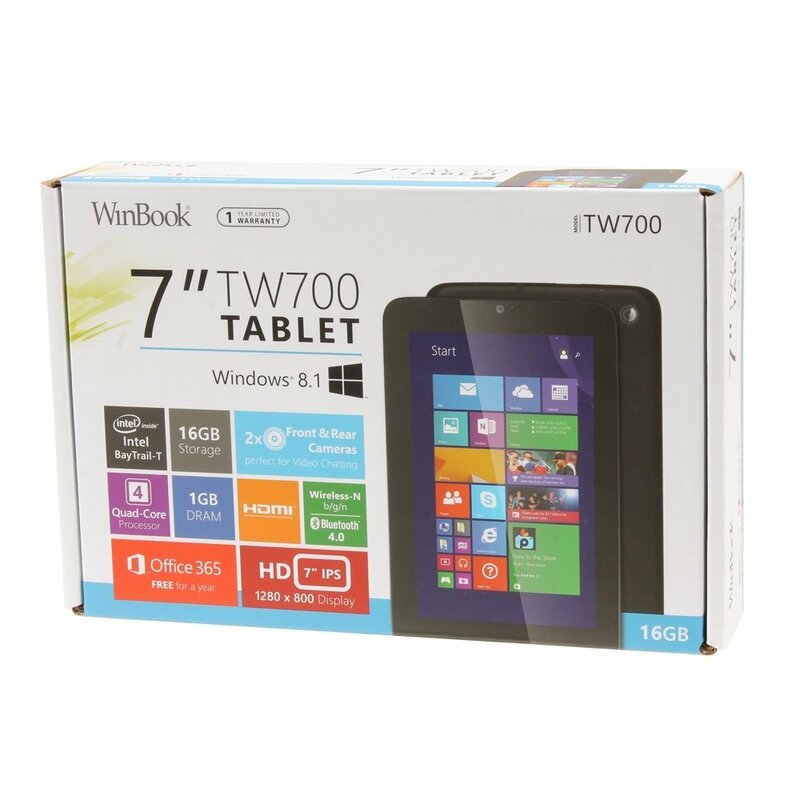 The WinBook TW700 came out of the box looking sleek, light, and futuristic despite the fact that it is heavier than many comparable tablets on the marketplace. The TW700 has a 7-inch screen which is surrounded by a thick black frame. The corners of the tablet are tapered off to create the illusion of lesser size, and it kind of works. Still, the TW700 feels sturdy in your hand and it definitely feels like it can take a little bit of a beating. The machine that we got was all black in color, perhaps in an attempt to slim the device down. Looking at the sides of the unit allowed us to see that the TW700 was fitted with a few handy connections. We’ve always been frustrated by the lack of representation for the USB slot in the tablet marketplace, the WinBook remedies that situation. This USB port is perfect for adding any USB device to your mobile experience. From your favorite keyboard all the way to your wireless mouse, you now have a way to cater to their needs. The USB slot is located right next to a micro-HDMI slot, a microSD slot (to expand your storage size) and your headphone jack. Between those three key ports, you will be able to handle just about anything that technology may throw at you. We couldn’t stop rolling our eyes at the fact that this $60 tablet had add-ons that rivaled the multi-hundred dollar tablets from other companies. The screen on the unit is seven inches long and has a resolution of 1280 x 800. For around $60 this is more than serviceable in terms of quality. We remember watching videos on our huge CRT monitors, so this is really hard to even compare it with. The screen itself is sharp and vibrant, colors pop and animation looks smooth. We ran a few videos through the screen and came away impressed. One of our favorite ways to employ tablet usage is on long flights. Loading up a good movie, putting on noise canceling earphones, and leaning back to relax is a great way to travel. We expect many people who look at the TW700 will be doing so with similar plans in mind. We found out why our tablet was so cheap as soon as we took a moment to check out the specs. On the whole, they are all moderate trending toward low-end. 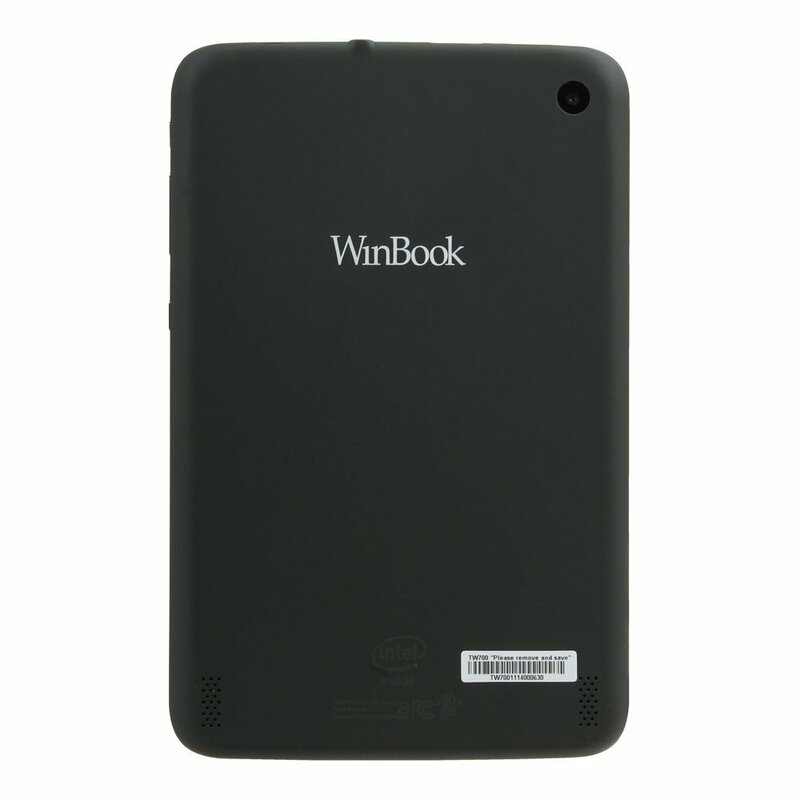 The WinBook comes built with a 1.33 GHz Intel Atom processor and a single gig of ram. Internally the WinBook has 16 GB of storage dedicated to your use right out of the box. For heavy tablet users, this 16 GB hard drive could prove problematic. 16 gigs go quickly when you want to stack your tablet with your favorite shows, music, videos, and pictures. So right away you will probably be looking to expand your HDD with a sizable SD card. Add another $25 to your purchase price to get an idea of what you are actually looking at price wise. Booting up the WinBook showed us a device that came as clean as it gets for prebuilt machinery. There was very little in the way of spam software on the machine and maybe 30 minutes worth of removing programs led us to a machine that sparkled with cleanliness. This is a far cry away from the IOS software that demands you keep their products on your machine. Still, even with all of this software deleted we found our HDD space infringed upon. Frowning won’t change anything so we kept on moving. The WinBook is also equipped with a pair of cameras, as is standard with mobile devices nowadays. Both cameras are 2 megapixels, the front facing, and the forward facing. The image quality you could get out of them isn’t very good in anything except ideal lighting. We found our image was a little grainy no matter what we did. We’re more likely to use those cameras for Skype and FaceTime situations anyway, so image quality isn’t paramount for our usage. The TW700 is also equipped with industry standard WiFi and Bluetooth technology. The WiFi (802.11 bgn) was a breeze to connect and we were even quickly accessing nearby hotspots while out on the town. Bluetooth 4.0 is installed in the Tw700 as well. We noticed that the battery life for Bluetooth usage was rated as ‘exceptional’ but we found little reason to actually use the function. I can see people using Bluetooth speakers to sync with their tablet during a get-together or party, but it didn’t come up during our trial run. We are avid Windows users and so we were absolutely thrilled when we saw both the quality of the WinBook TW700 and the price point of the device. Unfortunately, the biggest problem with the tablet still remains the lack of a booming app store. Tablets are turning into the second stop people make in the world of video games, and that should scare the guys at Windows. Without something as quality as the Itunes App Store, fans will pass up on their products. There are some apps that you can pick through but the choices are startlingly slim. We found the WinBook Tw700 to be near perfect for its actual price. When it comes to electronics, and tablets, it seems that everything decent is priced at almost $200. The fact that the TW700 can compete with these other units, despite its incredibly low price point, is a testament to the work put in by the developers.